A champion is a Trailblazer, an Innovator, a believer, someone who sees a future that others do not see and takes the initiative to act on that vision. 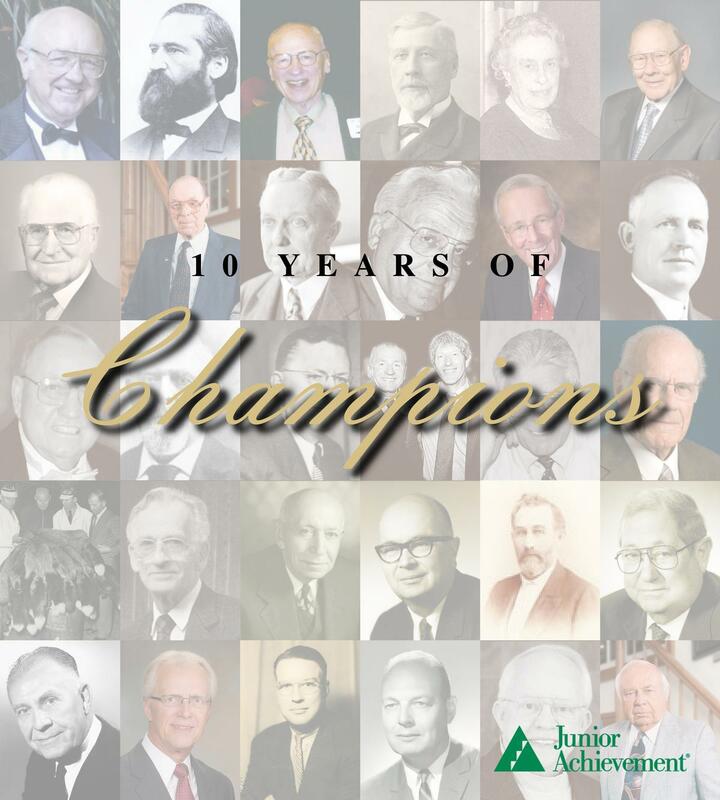 Knowing our community is rich with stories of visionary business people, Junior Achievement of Northcentral District has been telling the stories of these deserving individuals and recognizing them as a “Champion of Business”. These awards were created to identify the professional accomplishments of investors, leaders and business owners large and small throughout Northcentral Wisconsin. As we celebrate, let’s take a journey among ten years of Champions of Business award winners and the importance of their legacies. The trailblazers are those who led the way in establishing our community. Pioneering leaders like Alexander Stewart, Walter McIndoe and August Kickbusch helped jump start the first lumber companies that created much of the area’s early industry and were also among the first civic leaders to become formally elected officials. Walter Alexander, Cyrus Yawkey and Daniel Plumer were ground-breaking individuals who contributed to organizing several businesses and financial institutions, with Alexander and Yawkey belonging to the “Wausau Group,” who served as early venture capitalists securing the area’s future prospects after the lumber business declined. The believers are those who were advocates for our community’s growth and future, picking up the mantle from earlier business founders, and driving efforts forward. These Champions were true promoters that campaigned for our community to grow and thrive. This group includes individuals like DC Everest, John Ullrich, David Smith, Hans Hagge and William Sampe, who not only developed and nurtured their own industries, but took pride in lending a helping hand and encouraging other flourishing businesses. The vision and public service of Bart Kellenhauser, W.F> McCormick, Lane Ware, John Slayton and George Ruder demonstrated set new standards for how other leaders approach their professional and personal lives. The innovators are those who searched out new ways to do something or had ideas to improve or expand their business in the community. These honorees were industrious and restless — individuals like Marv Schuette and Bernie Greenheck took chances with their manufacturing companies that inspired growth and helped evolve their businesses beyond initial plans. Other innovators like Gordon Backer and the Henry were in completely different industries, but their shared foresight of expanding products and services, the ability to see the big picture of what their businesses could accomplish and the new ways to service customers were risks that paid off. The enterprisers are those who took the initiative in their industry and in our community, seeing a business potential and diving into a possibility that proved beneficial to the community. There were those with the vision to strike out on their own, like Ray Goldbach, E.O. Johnson and Richard Dudley, who rolled up their sleeves to take their ideas to new heights, and those whose expertise and drive led their companies to turn out products that added to the community’s manufacturing base, as Lula Jacob, Robert Greenheck and Dwight Davis did. Of course, no story about the entrepreneurial spirit is more interesting than the origin stories about where a business was founded. Ed Creske started Wausau Tile in his garage; Kolbe & Kolbe Windows by Herb and Ervin Kolbe in their mother’s wash house; and Art Juedes and Rick Gering began Eastbay by selling athletic shoes from the trunk of a car. All intriguing inspirations that demonstrate the courage it takes to make a business work. What a list of incredible individuals! Here’s to another ten years of Champion of Business award winners!